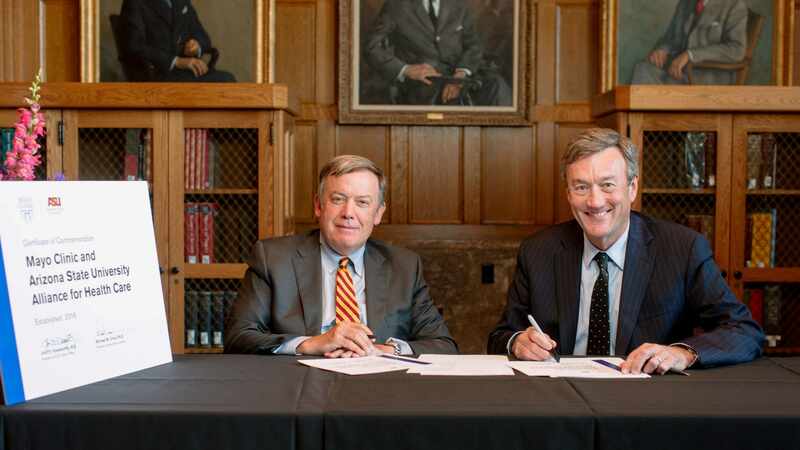 TEMPE, Arizona, and PHOENIX – Mayo Clinic and Arizona State University have announced the launch of a comprehensive new model for health care education and research: the Mayo Clinic and Arizona State University Alliance for Health Care. The goal of the alliance is to innovate health care delivery to improve patient care, accelerate cutting-edge research discoveries, and transform medical education. The alliance further links two of the Phoenix area’s most recognizable institutions. ASU recently was named the nation’s No. 1 “most innovative” university by U.S. News & World Report. Mayo Clinic earned the No. 1 top ranking nationally on 2016 U.S. News & World Report's Honor Roll of America's Best Hospitals, as well as the No. 1 spots for top hospitals in Arizona and Phoenix, Minnesota and Florida. The formalized alliance provides cohesion to a collection of joint projects, which have evolved over the past decade and sets the stage for many more. This expansion promises growing impact and scale. Evidence of the alliance soon will rise on land owned by ASU in northeast Phoenix adjacent to Mayo Clinic. ASU is planning to build a 150,000-square-foot Health Solutions Innovation Center to deliver a world-class learning environment. The leading-edge facility will feature a med-tech innovation accelerator, biomedical engineering and informatics research labs, and an education zone. The new facility is scheduled to break ground in 2017. One key part of the collaboration involves developing highly skilled physicians who can not only provide the finest in medical care, but also help shape and improve our nation’s complicated health care system. The national Mayo Clinic School of Medicine, which is expanding to Mayo’s Arizona campus in 2017, has collaborated with ASU to develop a specialized curriculum and certification in the science of health care delivery jointly conferred with ASU, which students earn concurrent with their medical degree from Mayo Clinic. Students will have the option of continuing beyond the certification to pursue a master’s degree in the science of health care delivery through ASU. For Mayo Clinic, the alliance spans activities in all three aspects of its mission — patient care, education and research — and is an example of public and private sector collaboration in the design, implementation and delivery of high-value health care. 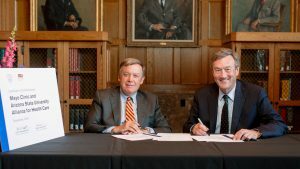 Since 2003, leaders from ASU and Mayo Clinic have worked together on a series of strategic collaborations, including dual-degree programs, a nursing education program, collaborative joint research projects, and more than 80 joint faculty appointments and numerous joint intellectual property disclosures. Collaborative initiatives have expanded over the years to encompass business, technology and other components of health care, including education. The Alliance has also caught the attention of leaders in Arizona. Learn more about the Mayo Clinic and ASU Alliance for Health Care here. The alliance is developing comprehensive improvements in the science of health care delivery and practice ─ all toward one goal: continually advancing patient care. Together, the recognized world leader in patient care, education and research, and the nation's No. 1-ranked university for innovation are combining expertise from every corner of health care — doctors to bioengineers to business experts — for an adaptive approach to preparing the next generation of health care pioneers and practitioners in our communities.